You desperately want to talk to your kid about your concerns with underage drinking, especially as it relates to driving. But the last thing that they seem to want to do is to listen. Especially to you. They think they know everything. And while it might not seem like it, your kid really is listening and needs to know you care. After all, parents are the leading influence on their teen’s decisions about alcohol, ahead of drivers education courses and teachers. We have created a number of research-based educational programs that address underage drinking at the elementary/middle-school, high school, and college levels, and track statistics and the latest available underage drinking research on this critical issue. Talking with your kids about alcohol early and often is the best way to keep them safe. Remember to continue these conversations throughout high school and beyond. If your teen is heading to college, click here. 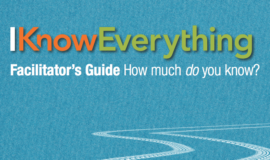 This facilitator’s guide provides ideas for discussing teen driver safety. This toolkit was developed to help teens implement a local advocacy plan.